For this recipe you can use salmon, trout, or a firm fleshed white fish like tilapia. The fish is moist, tender and flavorful. The recipe is simple and easy to make. For vegetables, you can also use zucchini, potatoes, fennel and others. Sprinkle salt and pepper on salmon. Cut the leek into 2 parts and then each piece in a half lengthwise. Clean shallots and cut into 4 pieces. Cut the carrot into medium-sized circles. Blanch vegetables in boiling salted water for 2 minutes, then drain. Chop the garlic and mix in a bowl with olive oil. 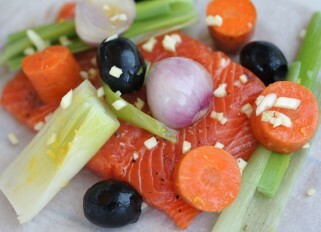 Pour the garlic oil over the vegetables, add the lemon zest, olives, a little salt, pepper and mix well. 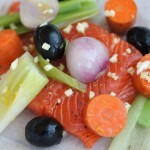 Lay the salmon fillet on parchment paper then add vegetables on top, then a piece of butter and thyme sprigs. Sprinkle with lemon juice. Wrap the ends of parchment paper tightly, twisting them well. Cook in an oven for about 15 minutes at a temperature 390F. Serve immediately.